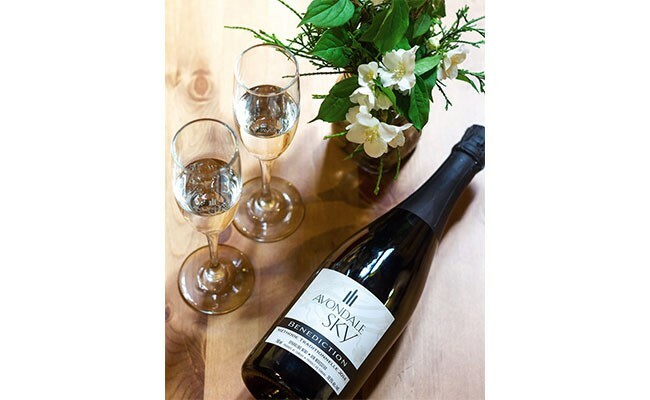 Avondale Sky Winery just released a new vintage of its Benediction, a traditional (Champagne) method sparkling wine made from Geisenheim 318—a grape hybrid bred at (and named for) the Geisenheim Research Centre, from parents Riesling and Chancellor. The grape may have originated in Germany, but the wine is all Nova Scotia. Apple cider and rising bread on the inhale, and in the mouth green apple and a long, clean finish with a slight bitter pop at the back of the tongue. Though the wine was finished with 24 grams-per-litre of residual sugar, you’d never know it; The balancing acidity makes it feel entirely dry. This wine packs a gentle punch. One of three grape varieties permitted to be the majority grape in the province’s appellation wine Tidal Bay, Geisenheim is an important varietal in Nova Scotia. (The others being l’Acadie Blanc and Seyval Blanc.) Avondale Sky uses Geisenheim in its Tidal Bay and in other wines, such as its oh-so-popular Bliss, a light, gentle white. Notes from the vineyard describe a brutal vintage with a happy ending for the Geisenheim-based bubbly. That’s because 2014 saw a colder than average winter that damaged buds, a late spring frost that killed shoots, a tropical storm that destroyed flowers and an average summer. But a good autumn can turn any vintage around, and in 2014 the fall was warm and dry, allowing grapes to ripen fully before frost. Get it while you can—the last vintage of Benediction sold out years ago—at Avondale Sky’s winery in Newport Landing or the Halifax Seaport Farmers’ Market on Saturdays. It’s $30 a bottle.